If you go to this website, you will see it is not in English but Chinese. If you do not know Chinese, you might wonder what good is this to me? 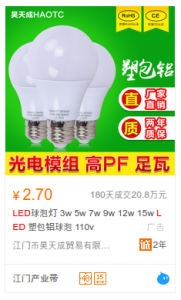 Well, you can get around the language problem by using Google Translate: https://translate.google.com/ So, if the product you are interested in is an “LED Light Bulb”, for example, you would go to Google Translate and type in that search term. You then select “Chinese (Simplified)” in Google Translate to get the Chinese translation of your search term. Next, you right click the Chinese version and select copy. Paste that copied Chinese search term into the search box on 1688.com. Look for the equivalent product to the product that your Alibaba supplier is quoting you in the page results that come up. The prices will be in Chinese Yuan. 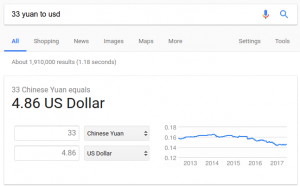 Take the prices in Chinese Yuan and convert them to US Dollars in Google. If the price is 33 Yuan, in a Google search just type in “33 Yuan to USD”. So, for the example I gave, 33 Yuan is equivalent to 4.86 US dollars. You can now compare your Alibaba supplier’s quoted price per item to the results from the 1688 search. You often will see that the price is significantly cheaper. This can be used as a negotiation tactic to get the best price from your supplier. It can also be used to qualify which are decent quotes from multiple suppliers. One product I got a quote on from an Alibaba manufacturer was about 30% higher than I found on 1688 from the SAME manufacturer. I respectfully pointed out that their price per item was lower on 1688 and successfully used that to negotiate a lower price. Note that some suppliers won’t necessarily like this technique, but if you are respectful in your negotiations with your supplier, they will usually come back with a better per unit price. Make sure you get a best initial quote that includes shipping from your Alibaba supplier before trying to negotiate from the results of your 1688 research. Otherwise, your supplier might reduce the apparent per unit price, but then jack up the shipping to where you are paying the overall same price as they originally quoted you. I have used this technique successfully and I hope that you will have success with it too!